...It all started many years ago with the purchase of an original Star Wars 'Oscars' quad movie poster (see A short history of the first British Star Wars posters) from the Vintage Magazine Shop in London's Brewer Street. Not since Kubrick's majestic 2001: A Space Odyssey had a science fiction film made such an impact on a cinema audience. Star Wars was to run for nearly a year in London. 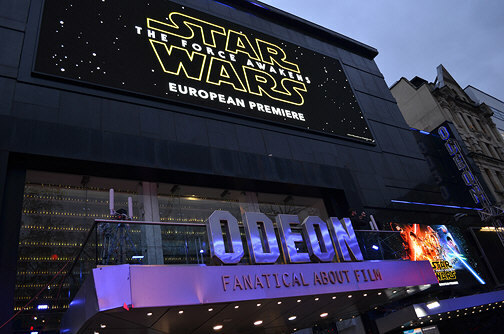 Star Wars The Force Awakens European Premiere - Odeon, Leicester Square, London, December 2015. 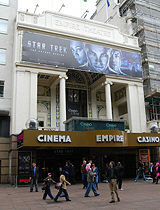 Star Trek The Future Begins - Empire, Leicester Square, London, May 2009. Then, in the Summer of 1980, The Empire Strikes Back was released and I was about to be seduced by the dark side (collecting sci-fi movie posters). I was in North Wales on a short contract working in a small theatre in Colwyn Bay, when the local cinema screened Star Wars: The Empire Strikes Back. The sequel was as impressive as the original, and I really wanted a copy of the poster. Not being near a movie poster shop I simply asked the cinema manager if I could have a spare poster when the run ended, and she kindly put one by for me. It had been folded and displayed, unlike my Star Wars poster, but that really didn't matter - this was a piece of cinema history, and I knew it. That's how my collection and passion for science fiction movies and film posters began. 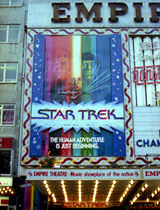 Star Trek The Motion Picture - Empire, Leicester Square, London, December 1979. 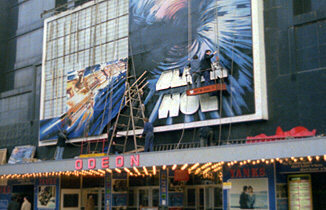 The Black Hole - Odeon, Leicester Square, London, December 1979. Kubrick's unsurpassable 2001: A Space Odyssey was re-released on the big screen hot on the heels of Star Wars. At around that time I also saw Close Encounters of the Third Kind in March '78, John Carpenter's Dark Star (a late night showing), Star Trek The Motion Picture in '79 and Alien also in '79, Flash Gordon in 1980, Outland in '81 and then later Blade Runner in 1982 and E.T. The Extra-Terrestrial, also in '82. It was quite a run! Star Wars Special Edition - Odeon, Leicester Square, London, 20th March 1997. Top: George Lucas waves to fans at the Royal Charity Premiere. Bottom: Mark Hamill. Today my passion for authentic science fiction vintage movie posters is as strong as ever. Theatrical posters, both old and new. Be it the vivid brush strokes of Tom Chantrell or the talents of a graphic artist behind a Mac, the job of the movie poster is the same now as it always has been - to lure audiences into the cinema. No doubt some of the sci-fi movie posters of today will take their place beside the classics of yesterday. And trying to predict which is half the fun - with some titles turning into very sound investments along the way. Every year more and more people discover the pleasure of owning an authentic piece of cinema history; it is my hope that our online movie poster shop will assist with that endeavour. 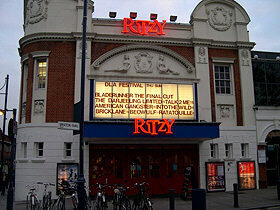 Blade Runner: The Final Cut - Ritzy, London WC2, November 2007. Ridley Scott's digitally revisited masterpiece enjoyed a very limited cinema screening in the UK in November and December 2007, before its nationwide DVD release. The British quad poster (above, with added red 'date banner' below the main title) was distributed to just a handful of UK cinemas. 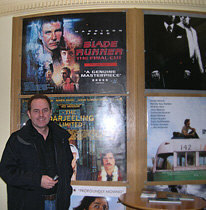 Photo: Sci-FiMoviePosters.co.uk owner Duncan Trillo, in the Ritzy's foyer. I hope you enjoy looking through my collection of vintage sci-fi film posters. I only sell original 'theatrical release' science fiction posters (not to be confused with 'souvenir' type mass-market reproductions) that I collected over the years. You'll find British Quads and US One Sheets, but also US Half Sheets, Japanese Hansai B2s, French, German and Polish posters and others from around the world. The vintage posters are indexed A-Z and 1-9 and there are also dedicated Star Wars and Star Trek sections for fans. 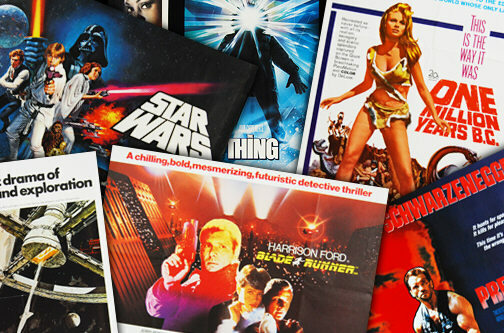 Whether a seasoned film poster collector, or someone simply looking to purchase one or two authentic original movie posters for your home, I am sure your purchases will bring you great pleasure for many years to come. This website was born out of a hobby... All sales are covered by a full money-back guarantee. This whole project is more about a passion for movie posters than anything else. I am using this website to slowly sell off my treasured film poster collection. If, for any reason, you want to return a poster you may do so (within 21 days of receipt) and I will refund you 100%. That 100% means I will refund the full original purchase price together with the original postage charge, and will also reimburse you with the cost of your return postage. Since launching I haven't had a single unsatisfied customer. For high quality custom-made poster frames here in the UK I have used, and can completely recommend, Brampton Picture Framing www.bramptonframing.com. Here's a great little book, and there are more Sci-Fi book recommendations on our links page. The Film Poster of the Month for April 2019 is this original Polish poster for James Cameron's Aliens in near mint condition..
"Denis Villeneuve's Dune Movie Could Be a Sci-Fi Masterpiece a Generation in the Making" Click Here. "Rogue One: 15 Reasons Why It’s The Best Star Wars Movie" Click Here. "Future shock: unearthing the most cutting-edge sci-fi movies of 2018" Click Here. "Blade Runner 2049 review – a gigantic spectacle of pure hallucinatory craziness" Click Here. "‘Star Wars: The Last Jedi’ Poster With Daisy Ridley, Mark Hamill Revealed" Click Here. "Netflix 2017: David Bowie’s son Duncan Jones to launch sci-fi movie Mute" Click Here. Blade Runner 2049 Announcement YouTube. ROGUE ONE: A STAR WARS STORY Official Teaser Trailer Click Here. Did Star Wars Just Jump Back Into the Oscar Race? Click Here. World's rarest Star Wars posters to be sold at auction after producer decides to flog 30-strong collection Click Here. Star Wars fans predict The Force Awakens will be the most stellar film of the franchise Click Here. 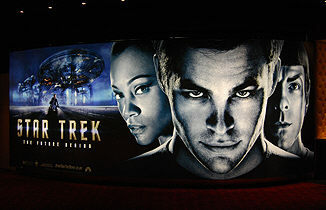 Paramount To Turn Scifi Classic The Stars My Destination Into A Movie Click Here. "'Buckle up! ': Disney releases new trailer for upcoming sci-fi future film Tomorrowland starring George Clooney" Click Here. Star Wars: The Force Awakens trailer causes storm Click Here. Star Wars: The Force Awakens Official Teaser Click Here. From a South London block to a galaxy far, far away... A look back at the roles that led John Boyega to Star Wars: The Force Awakens Click Here.